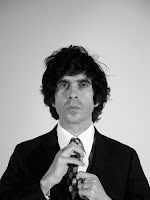 Ian Svenonius is Still the Sassiest Boy in America. Three years ago, Ian Svenonius published The Psychic Soviet, a set of some of the most intriguing critical essays of Rock and Roll -- or Western Popular Music Culture, ever produced. Later that year, Svenonius (who has previously been documented on this website) did a guest DJ set/interview with Dissonance, a Washington DC-based community radio show. A link to that complete show, with all of the great music intact, is at the Dissonance website (→). What I share here from my server today is a truncated version of that transmission, pared down to the interview and discussion portions, and a few of his bands's songs. I did this for myself (with ffmpeg as usual), but I've shared it in case anyone else wants it without having to put in the work. It's a fine thing to have in its original form, but if you're interested in the discussion, it might be nice to have it without so many interruptions. Cheers to Ian Svenonius, Sassy Magazine's 1990 Sassiest Boy in America (→).